This week marks the Department of History in Art’s eighth annual Annual Faculty Research Symposium. 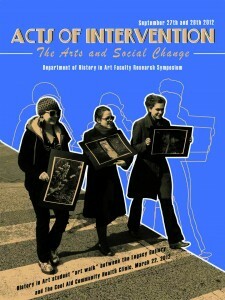 This year’s theme is Acts of Intervention: The Arts & Social Change, and features a full range of events: Wednesday night’s Visiting Artist double-bill, Thursday’s graduate student Action Charette and Friday’s main event, the full-day symposium—which also includes presentations by Orion guest lecturers Luigi Ferrara and John O’Brien. “Acts of Intervention” will examine how the production and interpretation of art can act as a social agent and catalyst for change. This year’s symposium will include presentations by historians of art and music, applied theatre, as well as creative writers and visual artists. Topics will embrace a wide range of cultures, media, and time periods to address issues ranging from climate change and sustainable housing to intervening in art history’s taxonomic and methodological conventions. It all kicks it all off on Wednesday night with a pair of Visiting Artist Talks featuring Luigi Ferrara and Susan MacWilliam, a noted Belfast artist who has an ongoing study of significant events in the history of paranormal research; MacWilliam is in town for a pair of shows at Open Space, F-L-A-M-M-A-R-I-O-N and Persistent Personalities. Join Ferrara and MacWilliam at 6:30pm Wednesday, September 26, in room A162 of the Visual Arts building. There will even be a bar on hand so attendees can get a drink between sessions! Thursdays Action Charrette for History in Art graduate students focuses on a process for creating art interventions on campus. This charrette will see grad students will undergo a collaborative and creative process that takes participants through the entire design process—from idea generation, conceptualization, research and development, to execution and presentation—over a very short period of time. 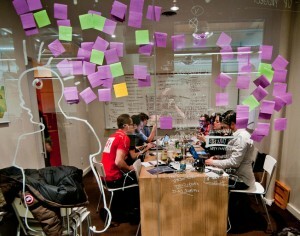 Charrettes typically bring together designers, developers and prospective investors with end users and stakeholders in a concentrated event resulting in outcomes that can range from concepts for spatial, program and business planning, to schematic drawings, development schedules, films and installations, etc. 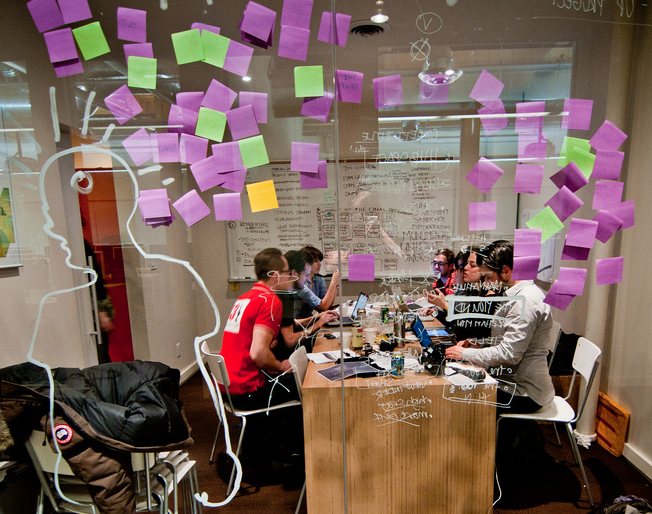 Clients typically use charrette results to develop investment opportunities for the project vision, and mobilize participants, end users or stakeholders to participate in the projectʼs next steps. This one runs 10am to noon in FIA 104, and will involve both guests Ferrara and O’Brian. Friday will see Ferrara—an acclaimed architect, designer, entrepreneur, educator and director of the Institute Without Boundaries—presenting his Orion lecture, “Learning to Change: A Change Lab in Action” at 11:00 am. 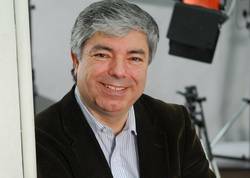 He will discuss the work of the Institute without Boundaries in formulating strategies for social, technical and ecological innovation that derive from philosophies of co-creation, community engagement, interdisciplinary collaboration and whole systems thinking. After that, O’Brian—professor of Art History and faculty associate of the Peter Wall Institute for Advanced Studies at UBC—will be offering his own Orion lecture, “Nuclear Invisibilities: The Man with the Bag on his Head,” as part of a larger project on nuclear photography in North America and Japan called “Camera Atomica.” He’ll speak at 3:00pm, and both talks will be in Visual Arts A146. A full schedule of symposium papers and times is listed below, but organizers Carolyn Butler-Palmer and Erin Campbell will be presenting papers, and have also invited fellow Fine Arts faculty members Paul Walde (Visual Arts), Maureen Bradley (Writing), Warwick Dobson (Theatre) and Jonathan Goldman (Music) to present, as well as their History in Art colleagues Evanthia Baboula, Christopher Thomas and Victoria Wyatt. Opening Friday’s session will be UVic’s Associate VP of Research, Dr. Michael Miller. Acts of Intervention runs 9:00am to 5:00pm Friday, September 28, in Visual Arts A146—and it’s absolutely free and open to the public. 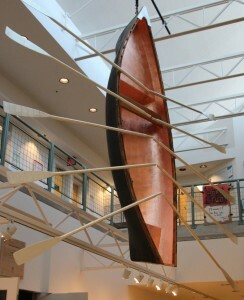 History in Art will also have a lobby display up in the Fine Arts building throughout Homecoming weekend. David Neel’s “Life on the 18th Hole” records and commemorates the seventy-eight day armed standoff between Mohawk warriors, Canadian armed forces, and the Quebec Provincial police in 1990. Although the print was widely circulated in the early 1990s, this work has received little scholarly attention. I argue that with the production of this photomontage, Neel transforms the space of the print into an indigenous place. 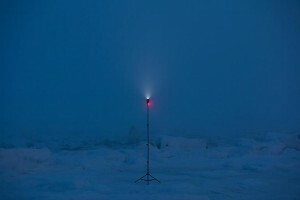 By amplifying cultural gestures in order to reveal their place within nature; and conversely, by capturing natural events through cultural apparatus, I am researching possible interconnections between landscape, identity, and technology in my studio practice. If the Canadian landscape can be considered a defining element of our cultural heritage, then anthropogenic global warming threatens not only to endanger our wellbeing, but our culture and way of life. Many of my works imagine the consequences of a warmer climate, one without permafrost, glaciers, snow, or temporary cultural artifacts such as snowballs. This talk will focus on several of these projects leading to a new work in progress in which extends this dialogue into a form of social practice and activism. 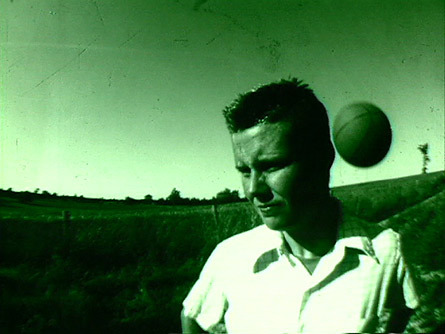 My film, video and transmedia practice has always germinated out of personal experience. I began making activist video twenty years ago and came of age as an artist amidst identity politics. Though my work has moved beyond the politics of identity per se, as media artist, I am always mindful of cultural appropriation. As a result, my work always stays close to home. Whether working in documentary, drama or conceptual forms, I always place myself within the frame, in some manner, as a means of maintaining my own code of political accountability. In this talk, I will reveal how this ethos led me to the difficult decision to film the loss of my home and community in 2009 at Pedder Bay in Metchosin. Burning Down My House, puts an artful lens on the BC housing crisis by highlighting the attack on affordable housing for the working poor. Indigenous arts embody epistemologies that offer vital alternatives to those underlying Western industrialized societies–but they must find venues to speak cross-culturally on their own terms. Their power to mediate social change diminishes when they are studied within the methodologies of the dominant thought systems they challenge. 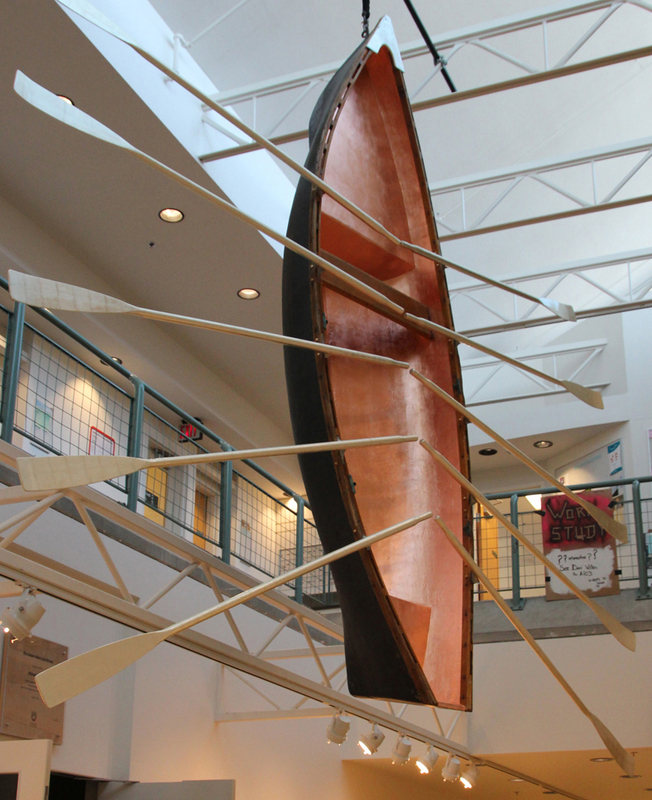 Recently, many indigenous artists and writers have criticized conventional academic research, insisting instead on quite different approaches that best suit indigenous epistemologies and cultural contexts. My paper discusses the implications of their voices on art historical and contemporary treatments of indigenous arts. It argues that being an “objective” outside observer, as conventional academic research requires, conflicts with the philosophies in many indigenous arts and erects barriers to social change. When considering arts that suggest alternatives to “mainstream” societal assumptions, art historians cannot remain detached. Inspired by anthropologist Tim Ingold’s call to listen to what the things in the world are telling us, this paper proposes an ecological approach to the early modern domestic interior. 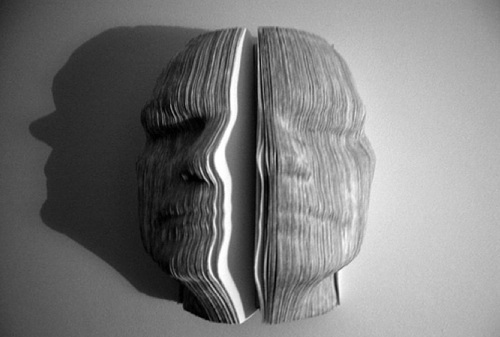 In particular, the paper examines the concepts of ecology, meshwork, assemblage, distributive agency, vital materiality, and matter as social performance, which appear in the work of political scientist Jane Bennett, feminist philosopher Karen Barad, sociologist Bruno Latour, and Tim Ingold. As the paper argues, these concepts provide a phenomenological, integrative, and non-hierarchical framework for the study of the home as an environment, giving us the tools to detect and analyze the social and material processes through which the human and the material are intertwined. • Dr. Warwick Dobson, Theatre: No Happy Endings: What Can Applied Theatre Really Do? In the wake of the October Revolution, Lenin said: theatre is a weapon to be used in the service of the socialist revolution. Latterly, the idea that theatre is a weapon has become an article of faith for most applied theatre practitioners; and many an extravagant claim has been made by those who see theatre as a powerful means of ameliorating the conditions of the vulnerable, the marginalized and the oppressed. In the past fifty years, a large number of well-meaning, good-intentioned projects with ambitious aims have taken place globally – all, no doubt, fuelled by the hope of a truly happy ending. But what kinds of happy endings are we legitimately entitled to expect from our endeavours? This paper seeks to pose two questions that applied theatre practitioners have traditionally been reluctant to engage with: firstly, is theatre a weapon? and secondly, what can it really do? This ‘work in progress’ paper reflects on the presence of the emperor of Byzantium, Manuel II, in the royal court of France between 1400 and 1402. Although the imperial visit to France, including a short visit to England, engendered much interest by chroniclers, consideration of Manuel II’s ceremonial presence in these royal courts is often divided from the more active nature of his diplomatic goal of achieving assistance for his own empire. But there is plenty of material about his participation in courtly life: he gave and received gifts; he participated in feasts and princely weddings; artists were clearly inspired by his presence for a long time after his visit was over, and he was aware of current religious debates in Catholic Europe. The paper argues that the emperor’s presence should be seen as an active intervention of Manuel II in the European courts and connected with the late medieval growth of interest in the Classical past and the Greek language. In 1973, recognizing Canadians’ need for an organization drawing together people from various fields engaged with architecture and its history and restoration, Martin Eli Weil, a young American architect recruited to the Restoration Services branch of Canada’s federal parks service, assembled a group of architects, academics, civil servants, and preservationists around a plan for a “Society for the Study of Architecture in Canada” (SSAC). Working with a steering committee that represented all regions, Martin organized the drafting of a constitution, the incorporation of the body and its certification as a learned society, the establishment of a system of working committees, the holding of annual conferences (which I, as a young graduate student, attended), and the publication of a quarterly newsletter, now a journal. Martin Weil died in 2009, but the SSAC lives on forty years later, a tribute, above all, to two things: Martin’s visionary leadership and Canada’s nationalistic zeal and concern for historic preservation in the 1970s. In 1960 the Argentinean-born Mauricio Kagel composed Pandorasbox (Bandoneonpiece), a theatrical work in which the performer speaks, gesticulates, and spins on a rotating platform. His friend, the pianist David Tudor had acquired a bandoneon shortly thereafter and began to perform on it extensively, playing not only Pandorasbox but also works he commissioned, such as Gordon Mumma’s Mesa (1966), later used by the Merce Cunningham Dance Company, in which sound captured from six microphones passes through four voltage-controlled attenuators. Tudor’s explorations culminated in his own composition entitled Bandoneon! (a combine), a multimedia work with live electronics produced as one of the 9 Evenings organized by Experiments in Arts and Technology (E.A.T.) in 1966. This paper traces the origins of a remarkable outburst of compositional activity in the American avant-garde that resulted from Tudor’s initial association with Mauricio Kagel, his engagement with the bandoneon, and the extraordinary sensibilities of a virtuosic musician who was in the process of changing his primary mode of making music. Do diets really work—and, if so, what type? Find out when the Lafayette Health Series returns with its seventh annual installment of challenging and fascinating discussions about community health. This year’s topic is “Weighing in on Fat: What makes us obese and what we can do about it,” and it runs from 7-9pm on Thursday, September 27 in the David Lam Auditorium. With so much information about dieting and exercise at our disposal, why is it most nations claim that obesity is at a crisis level? And how is it that human beings are said to be on average three times heavier than they were just in the 1960s? Find out the answers to these and other provocative questions when the Lafayette Health Series invites their special guests to talk about the latest science which will help us better understand the biology involved to effectively maintain a healthy body weight. In addition, Allen Hayashi (MD FRCS(C), General and Pediatric Surgeon, Head Division of General Surgery) will be the panel facilitator and will make some comments on bariatric surgery, and Darlene Hammell (MD CCFP Assistant Dean Student Affairs) of UVic’s Island Medical Program will offer the closing commentary. 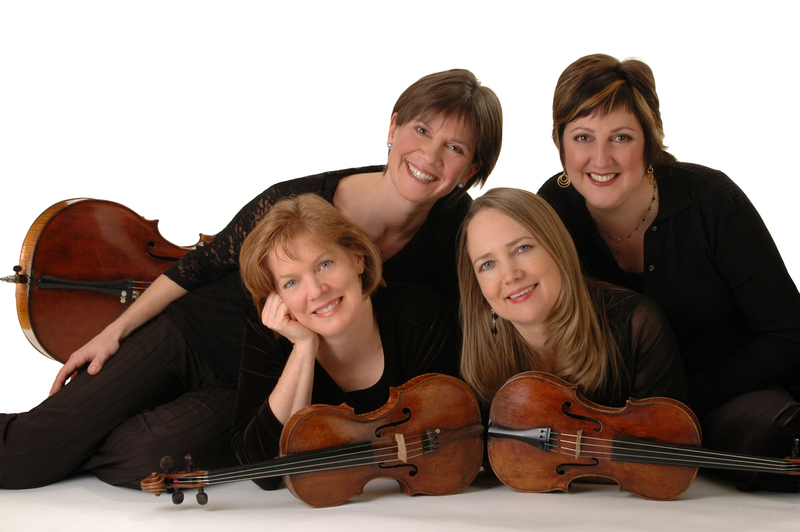 The Lafayette Health Awareness Series began in 2006 with a dialogue on the topic of breast cancer, which impacted the Lafayette String Quartet profoundly when one of its members was diagnosed and treated in 2001. The Lafayette Health Awareness Forum was then created to provide expert and updated health information to the public in a free forum on various health topics. With the quartet’s experience that what affects one will eventually affects us all, it was their wish to offer some tangible way to share with the community their gratitude for this universal connection. The Lafayette Health Awareness Forum continues to bring this interconnection to our local community and provides the opportunity for specialists, health professionals and the general public to meet and dialogue on important health topics. Tickets to this event are free, but you can reserve a seat by emailing lafayettehealth@shaw.ca. When celebrated pianist Robert Silverman performs at the University of Victoria’s Steinway Fundraiser on September 23, it won’t just be a rare local appearance by one of Canada’s premiere pianists—it will also mark his reunion with the acclaimed Lafayette String Quartet. While they collaborated a number of times 20-odd years ago, it has been years since Silverman and the LSQ last appeared on stage together. But it was Silverman who broke the public news that the LSQ were becoming Artists-in-Residence at UVic back in 1991. After that initial performance, says Stanis, Silverman and the LSQ played together in various venues across Canada and the U.S., including another Friends of Chamber Music series (this time playing the Brahms Piano Quintet) at UBC in 1991—just days after the LSQ accepted the offer to become Artists-in-Residence at UVic. “Robert made the announcement from the stage that we would be moving to Victoria and welcomed us to the west coast,” Stanis fondly recalls. 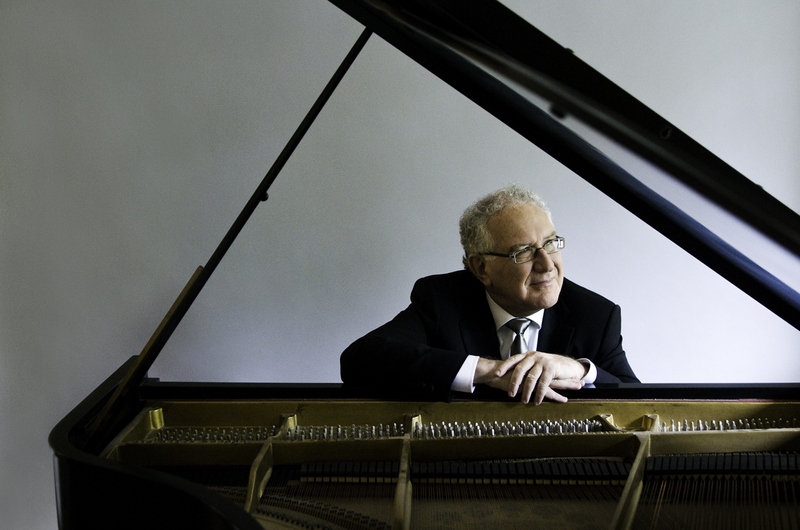 Recognized as one of Canada’s premiere pianists, Dr. Robert Silverman was a faculty member at the University of British Columbia for 30 years and has performed in concert halls throughout North America, Europe, Australia and the Far East. He has appeared with orchestras on three continents, including the Chicago Symphony, the Sydney Symphony, the BBC (London) Symphony, the St. Petersburg Philharmonic Orchestras and every major orchestra in Canada. The distinguished pianist has performed under the batons of such renowned conductors as Seiji Ozawa, John Eliot Gardiner, Gerard Schwarz, Neeme Järvi, and the late Kiril Kondrashin and Sergiu Comissiona. He has appeared with orchestras on three continents, including the Chicago Symphony, the Sydney Symphony, the BBC (London) Symphony, the St. Petersburg Philharmonic Orchestras, and every major orchestra in Canada. Silverman’s discography includes over 30 CDs and a dozen LPs. His recording of Liszt’s piano music received a Grand Prix du Disque from the Liszt Society of Budapest, while his widely-acclaimed 10-CD recording of all thirty-two Beethoven sonatas was short-listed for a Juno Award. His 7-CD album of all the Mozart Sonatas is due for release in 2010. Robert Silverman and the Lafayette String Quartet perform 2:30pm on Sunday, September 23, in the Phillip T. Young Recital Hall. Tickets are available in person or online at the University Ticket Centre or (250) 721-8480. The ever-popular Visiting Artist free lecture series is back once again, presenting a fascinating series of local, national and international artists and cultural figures guaranteed to make you think. Organized this year by new associate professor Paule Walde and presented by the Department of Visual Arts, we’ve already seen the first lecture of the fall 2012 season—Visual Arts grad and current Thompson Rivers University sculpture and intermedia professor Doug Buis—but there’s a full schedule of artists slated to run through November. Up next is Nicholas Galanin, the 2012/13 Audain Visiting Professor in Contemporary Arts of the Pacific Northwest. Born in Sitka, Alaska, Galanin is a multi-disciplinary Tlingit/Aleut artist who has struck an intriguing balance between his origins and exploration in new perceptual territory. Galanin studied at the London Guildhall University, where he received a BFA with honours in Jewelry Design and Silversmithing, and at Massey University in New Zealand earning a Master’s in Indigenous Visual Arts. Valuing his culture as highly as his individuality, Galanin has created an unusual path for himself by deftly navigating “the politics of cultural representation” and balancing both ends of the aesthetic spectrum. 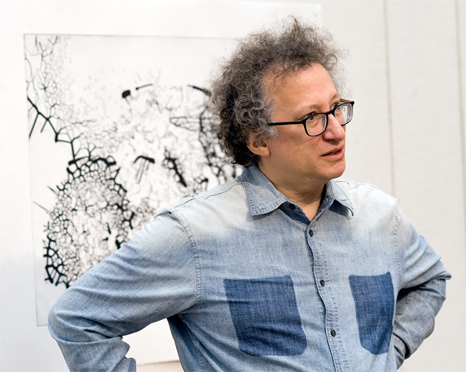 Hear him speak at 8pm Wednesday, September 19, in room A162 of the Visual Arts building. The following week sees a special double bill of visiting Orion Lecturer Luigi Ferrara and Irish installation artist Susan MacWilliam. Ferrara—an acclaimed architect, designer, entrepreneur, educator and director of the Institute Without Boundaries—comes to us as part of his participation in History in Art’s annual Faculty Research Symposium (more on that below). MacWilliam—a noted Belfast artist who has an ongoing study of significant events in the history of paranormal research—is in town for a pair of shows at Open Space, F-L-A-M-M-A-R-I-O-N and Persistent Personalities. Ferrara speaks at 6:30pm followed by MacWilliam at 8pm Wednesday, September 26, in room A162 of the Visual Arts building. There will even be a bar on hand so attendees can get a drink between sessions! 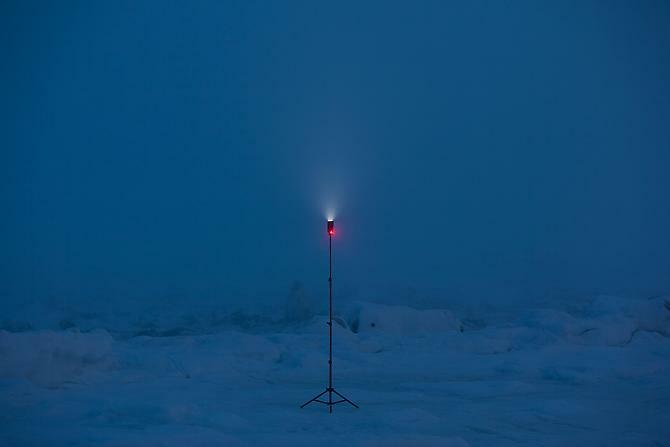 After that comes Ottawa-based photo and installation artist Andrew Wright. An assistant professor of visual art at the University of Ottawa, Wright’s work is described as “multi-tiered inquiries into the nature of perception, photographic structures and technologies, and the ways we relate to an essentially mediated and primarily visual world.” With linkages to practices as diverse as Alfred Stieglitz and Iain Baxter& (with whom Wright worked in the ’90s), Wright’s use of photography is decidedly non-conventional as it eschews lyricism and traditional pictorial aims. 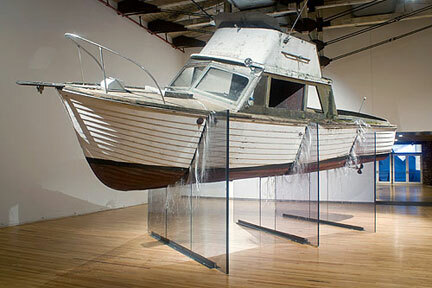 The award-winning artist and six-time Sobey nominee has exhibited both nationally and internationally, participated in residencies including the Banff Centre and Braziers Workshop (U.K.), as a war artist with the Canadian Forces Artist Program aboard Canadian warship H.M.C.S. Toronto and is the founding Artistic Director for Contemporary Art Forum Kitchener and Area. Hear him talk at 8pm Wednesday, October 3, in room A162 of the Visual Arts building. Deirdre Logue. 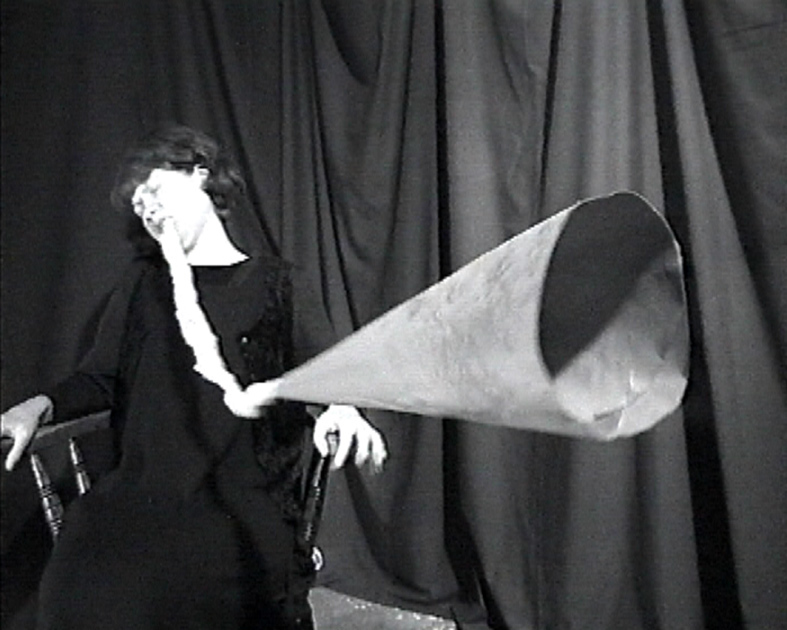 Her performance-based film, video and installation works are self-portraits uniquely located between comfort and trauma, self-liberation and self-annihilation. By using domestic objects and spaces to contrary ends, Logue’s works capture gesture, duration and the body as both subject and object. Her practice is not production or “master narrative” driven nor is it dependent on the use of tools typically applied in conventional film and video; rather her work is made in a direct move away from an industry model and is expressly personal, emotional and political. 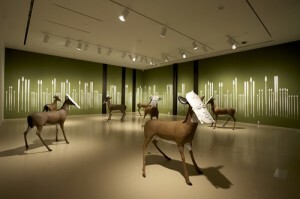 Solo exhibitions of her award-winning work have taken place in Canadian, American and European film festivals. Deirdre is also the co-founder and director of the Feminist Art Gallery in Toronto where she lives and works. See what she’s all about at 8pm Wednesday, October 10, in room A162 of the Visual Arts building. Still to be confirmed is the actual date in October when noted curator Denise Markonish will be visiting. Markonish is the curator at MASS MoCA, where she has curated the exhibitions Petah Coyne’s Everything That Rises Must Converge; Inigo Manglano-Ovalle’s Gravity is a force to be reckoned with; and These Days: Elegies for Modern Times and Badlands. Markonish has also curated exhibitions at Artspace (New Haven, CT), the Fuller Museum (Brockton, MA) and the Main Line Art Center (Haverford, PA), and has taught at University of New Haven, Stonehill College and the Rhode Island School of Design. Markonish recently completed Oh! Canada, one of the largest survey shows of Contemporary Canadian Art ever presented outside of Canada. Once the date is set, Markonish will also be in room A162 of the Visual Arts building. Come November, you can expect a lively evening with well-known British art critic Barry Schwabsky. 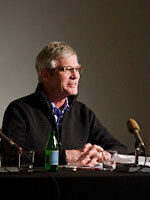 The London-based Schwabsky is the art critic for The Nation and has been writing about art for the magazine since 2005; his essays have appeared in many other publications, including Flash Art (Milan), Artforum, the London Review of Books and Art in America. His books include The Widening Circle: Con­sequences of Modernism in Contemporary Art, Vitamin P: New Perspectives in Painting and several volumes of poetry. Schwabsky has contributed to books and catalogs on artists such as Henri Matisse, Alighiero Boetti, Jessica Stockholder and Gillian Wearing, and has taught at the School of Visual Arts, Pratt Institute, New York University, Goldsmiths College (University of London) and Yale University. 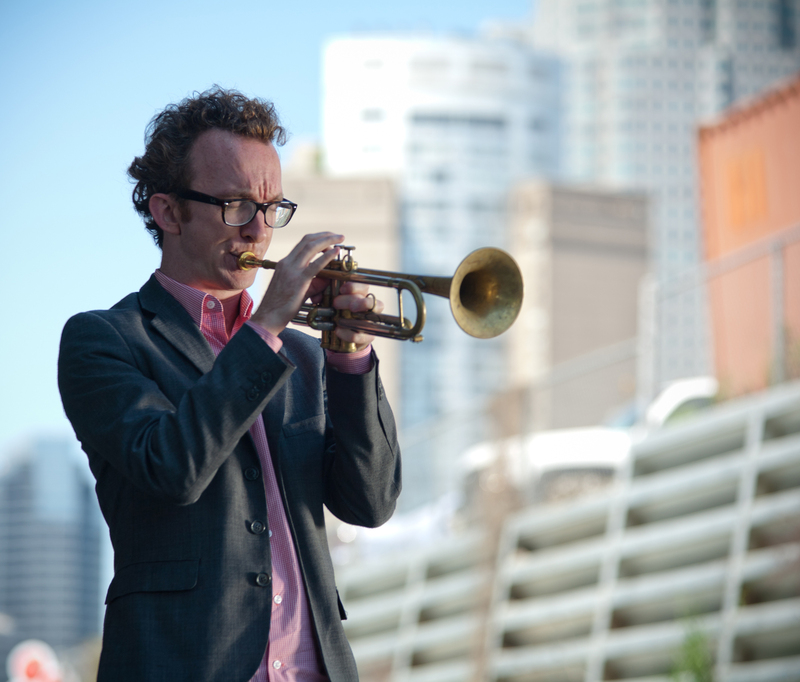 Hear him at 8pm Wednesday, November 7, in room A162 of the Visual Arts building. Our final Visiting Artist of 2012 will be New Yorker Brendan Fernandes. Born in Kenya of Indian descent, Fernandes immigrated to Canada in 1989, then completed the Independent Study Program of the Whitney Museum of American Art (2007), earned a BFA from York University (2002) and his MFA from the University of Western Ontario (2005). He has exhibited nationally and internationally, including exhibitions at the Solomon R. Guggenheim Museum, the Museum of Art and Design (New York), the Musée d’art contemporain de Montréal, the National Gallery of Canada, Mass MoCA, the Andy Warhol Museum, Deutsche Guggenheim, the Third Guangzhou Triennial and the Western New York Biennial through The Albright-Knox Art Gallery, among others. Currently splitting his time between Toronto and New York, Fernandes has participated in numerous residency programs including The Canada Council for the Arts International Residency in Trinidad and Tobago (2006), The Lower Manhattan Cultural Council’s Work Space (2008) and Swing Space (2009) programs, and invitations to the Gyeonggi Creation Center at the Gyeonggi Museum of Modern Art, Korea (2009) and ZKM, Karlsruhe, Germany (2011). Catch him at 8pm Wednesday, November 21, in room A162 of the Visual Arts building. 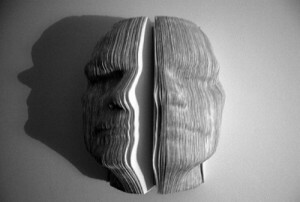 There will be a new slate of Visiting Artists in 2013. Stay tuned for details! It’s here! 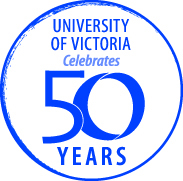 This weekend is UVic’s first Homecoming Weekend, in celebration of the 50th Anniversary. 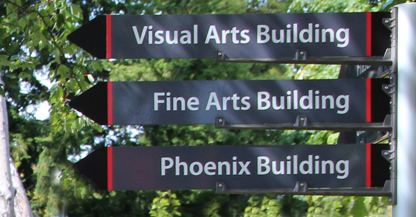 Be sure to visit the Faculty of Fine Arts, where we have a number of events planned. But you don’t have to wait until the main events get underway on September 28 & 29—we’re so keen on our side of the Ring that we’re starting a few days early! • It all kicks it all off on September 26 with a pair of Visiting Artist Talks featuring Luigi Ferrara and Susan MacWilliam. Ferrara—an acclaimed architect, designer, entrepreneur, educator and director of the Institute Without Boundaries—comes to us as part of his participation in History in Art’s annual Faculty Research Symposium (more on that below). MacWilliam—a noted Belfast artist who has an ongoing study of significant events in the history of paranormal research—is in town for a pair of shows at Open Space, F-L-A-M-M-A-R-I-O-N and Persistent Personalities. Join Ferrara and MacWilliam at 6:30pm Wednesday, September 26, in room A162 of the Visual Arts building. There will even be a bar on hand so attendees can get a drink between sessions! • Come September 28, it’s time for History in Art’s Annual Faculty Research Symposium. 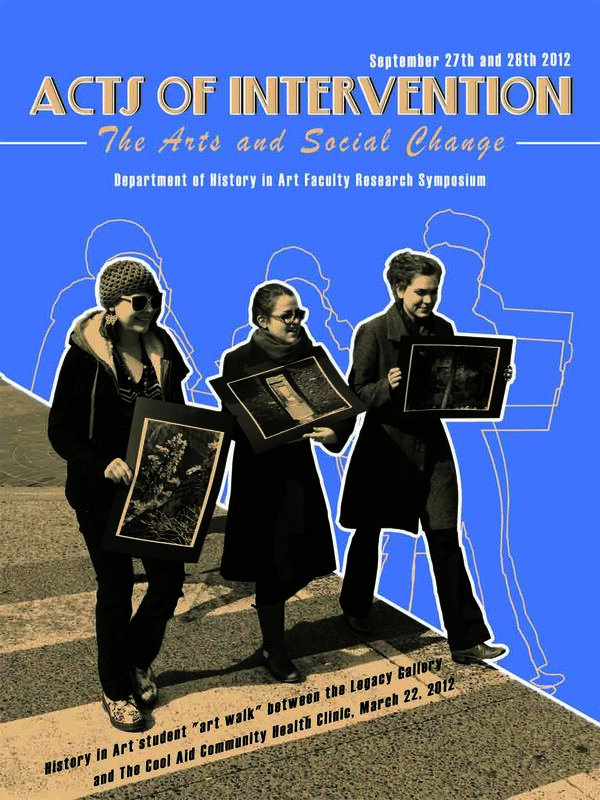 This year’s theme is Acts of Intervention: The Arts & Social Change, and features Orion guest lecturers Luigi Ferrara and John O’Brien. Ferrara, who we’ve already heard about, will be presenting his Orion lecture, “Learning to Change: A Change Lab in Action,” at 11:00 am, while O’Brien—professor of Art History and faculty associate of the Peter Wall Institute for Advanced Studies at UBC—will be offering his own Orion lecture, “Nuclear Invisibilities: The Man with the Bag on his Head” at 3:00pm. Symposium organizers Carolyn Butler-Palmer and Erin Campbell will be presenting papers, and have also invited fellow Fine Arts faculty members Paul Walde (Visual Arts), Maureen Bradley (Writing), Warwick Dobson (Theatre) and Jonathan Goldman (Music) to present papers, as well as their History in Art colleagues Evanthia Baboula, Christopher Thomas and Victoria Wyatt. Opening the day will be UVic’s Associate VP of Research, Dr. Michael Miller. Acts of Intervention runs 9:00am to 5:00pm Friday, September 28, in Visual Arts A146—and it’s absolutely free and open to the public. History in Art will also have a lobby display up in the Fine Arts building throughout Homecoming weekend. • The School of Music kicks off the day with an 11:30am Hand Drumming Workshop featuring instructor Jordan Hanson—whose music therapy work was recently featured in the local Times Colonist—in MacLaurin B037. (Bring your own drum or use one of the drums provided for free!) Music will also be hosting a “Sight Reading” open house with faculty and students playing fresh off the sheet music, from 1:00 to 3:00pm. • Phoenix Theatre will also be offering an open house with guided backstage tours—get a glimpse of the backstage magic with visits to props, costumes, dressing rooms and more! Gather in the Phoenix lobby, where the tours will leave every 30 minutes between 2:00 and 4:00 pm. • Writing will be screening their Leo Award-winning web series Freshman’s Wharf—collaboratively created by Writing students, staff and faculty—from 1:00 to 2:00pm in FIA 103. • Arts Place café will also be open from 11am-2pm so visitors can get a coffee and snack (and pick up a copy of Ian McDougall’s Fine Arts benefit CD, The Very Thought of You). and take in their current exhibit, Building the University Art Collection: 50 Years. Gallery hours are 10:00am to 4:00pm, Wednesdays to Saturdays.) Building the University Art Collection will trace the development of UVic by highlighting key collections and objects acquired over the years, and runs through to October 27.